Here's our selection of some of the best organized American Gran Fondos for 2016. 2016 sees the world focus on sustainability, improving health and reducing carbon emissions. So naturally, cycling gains popularity as a means of travel, increasing fitness and encouraging the uptake of sport. Unlike their Italian cousins, US Gran Fondos have organically grown into mass-start cycling events, run on open and closed roads, with participant support and an element of competition in the form of chip-timing for the duration of the event or for sections of the event - typically hill climbs or some cases, Strava submissions. Many cyclists use Gran Fondos to challenge themselves in a personal battle against the distance and then ultimately, the clock. Some have podium prizes for different categories for the top finishers. As in Italy, top riders will race, with prizes awarded and considerable prestige for the top placed finishers. In short, it's the closest most of us will ever come to knowing what it feels like to be a full-on pro-racer, and - it will be the most fun you've ever had on a bike. But these rides are for everyone, so don't worry, most have distances to suit all abilities! 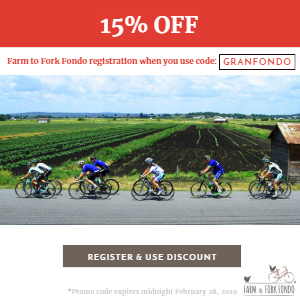 You can ride a Gran Fondo at any pace you choose, and no matter what your speed or competitive nature, a big event like this is guaranteed to be an experience unlike anything you've ever done before. So whether it's to improve your fitness, stay healthy, or as an environmental choice - taking up cycling will be one of the best decisions you ever make. So why not make it your resolution in 2016 to ride one? Since it began over 10 years ago, the Tour of Battenkill, originally called the Battenkill-Roubaix in upstate New York - has skyrocketed. The Tour of Battenkill's steep punchy climbs are legendary in shattering fields of riders, both amateurs and Pro's alike. With approximately 3,000 starters across 38 races in recent years, it probably is America's largest single day races. The Tour of Battenkill Gran Fondo allows amateur cyclists to experience the professional course of 68 miles of rolling terrain on both dirt and paved roads as they travel through the world famous Battenkill Valley. Set in early spring, the race starts and finishes in the scenic village of Cambridge, New York and courses through covered bridges, family farms, and rural villages along the many challenging back country roads that traverse Southern Washington County, New York. The course features rolling countryside, covered bridges, and direct passes through several small villages. There are many challenging climbs - total climbing is 4029 feet - with a maximum gradient of 17%. 39/25 gearing is recommended. 68 miles, 4029 ft elevation gain, 8 dirt sections of 14 miles. For racers and non-racers, the Tour of the Battenkill Open is a mass-start, gran fondo-style event. "While the Pro/Am race participation remains popular, the Gran Fondo participation is doubling each year, with nearly 500 in 2015. We expect that trend to continue for 2016 and beyond" said Dieter Drake, President, Anthem Sports. If you want to get fit and experience the ride before May, look out for the Battenkill Spring Preview Ride on April 23rd too. Registration is open - this is a real test! Jeremiah Bishop’s favourite training route earned its nickname with glorious mountain top meadows, winding climbs and hillside farms reminiscent of the Austrian, German and Swiss settings where he has competed. This magnificent scenery is the backdrop for the most challenging and adventurous Gran Fondo in the US. 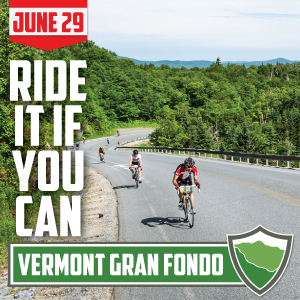 The route begins in Harrisonburg, Virginia and covers 107 miles featuring over 11,000 feet of climbing and two dirt road mountain climbs – one the toughest Gran Fondo in the States! If you want to take on the Alpine Loop, you must be aware of the unique challenges presented by the road surfaces and terrain, and follow equipment requirements to stay safe. Returning as classic routes for the 2016 Alpine Loop Gran Fondo, there are two ways to experience the renowned riding of the Shenandoah Valley: The Valley View Challenge and Mt Solon Metric Century. These routes offer an experience for cyclists of all abilities! The Valley View Challenge is a 36-mile route that showcases the idyllic scenery and country roads that make Harrisonburg and Rockingham County, Virginia famed riding destinations. The route is almost entirely paved; we’ve thrown in a few brief connectors on little dirt roads, over low-water bridges and up country lanes – and they make the experience one to remember! Don’t let the “Valley” fool you; this route offers a great challenge with over 2,600 feet of rolling climbs and a steep jaunt up Mole Hill. The Mt Solon Metric Century offers 62.4 miles of Shenandoah Valley riding, including beautiful country lanes and nearly-secret riverside roads beyond Mt Solon. This route rolls through 3,743 feet of climbing. Cyclists riding the Alpine Loop, Shenandoah Mountain Century and Shenandoah Mountain Adventure routes can compete for the Prostate Cancer Awareness Project King and Queen of the Mountains titles. Prostate Cancer Awareness Project KOM Jerseys will be awarded to men’s and women’s winners in 5-year age group categories. The Alpine Loop's mission supports the Shenandoah Valley Bicycle Coalition, Prostate Cancer Awareness Project and in 2015 the Harrisonburg Central Park, a venue for the event. Registration is now open and early entry is advised. In its 6th year the Gran Fondo Miami continues to thrive and is a historical event in the evolution of US Gran Fondos. 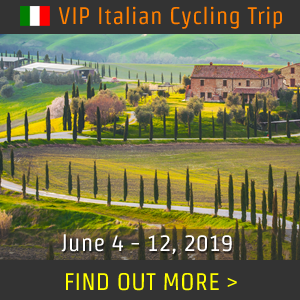 The event is the continuation of five previous events with genuine Italian-style cycling. Previous editions have attracted well over 2,000 participants. The 3 routes that tour the Miami region of 25, 60 and 100 miles are dead pan flat - however the Gran Fondo course comes complete with built-in "wind training" for those who may think the relatively flat terrain comes without any challenges! The event is timed, fully signposted and well supported with feed stations etc. The Lamborghini mass-start rollout down the Miracle Mile in Coral Gables is pure cycling experience - made only in Italy! The finish at Miami City Council adds a unique atmophere for riders to celebrate at the Italian food and pasta party. Top model Claudia Romani voted one of the 100 Sexiest Women in the World is usually on hand to welcome everyone and wave you Buon viaggio! The 2015 event was a great success and this event is back on course - to be one of America's BEST Gran Fondo's. Ciao bella mi amore! Registration is now open. A four-day "Celebration of Cycling," the Subaru Sea Otter Classic is regarded as the world's largest cycling festival. Part recreational biking, part competitive event, part festival, part expo and 100 percent fun, the Sea Otter Classic returns to Monterey, California from April 14-17, 2016. This action-packed cycling extravaganza features amateur and pro cycling events as well as family activities for all ages, attracting 65,000 fans from around the world. The Sea Otter Classic also plays host to one of the largest consumer bike expos in the world. The Velofix Gran Fondo welcomes riders of all capabilities to register for either of the road routes. Children age twelve and up are welcome when accompanied by a parent or adult guardian. Savor the Ride Both of the two Gran Fondo road routes (Carmel Valley and Coastal) are intended to be enjoyed with family, or friends—whether they’re old pals or friends newly made on the ride. Have fun in the company of others, surrounded by beautiful vistas of Monterey County, and take time for the refreshment that awaits you at each rest stop. Refueling Stations Broth routes provide refueling and hydration stations with refueling spots along the way. Based out of beautiful downtown Golden, CO, the Golden Gran Fondo will take racers on a historic circuit through the Rocky Mountains. Beginning with an ascent up Lookout Mountain, the start of the event traces the route of the inaugural USA Pro Cycling Challenge. Lookout Mountain, offers spectacular views across the Front Range Mountains, down on the city of Golden and the Coors Beer brewery. The course then continues it’s tracing of historical bicycle racing with a long climb towards the continental divide and some of the same roads used in the Coors Classic and featured in the movie American Flyers (Kevin Costner’s classic cycling film that was set in Golden). 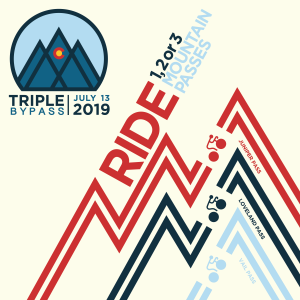 Upon reaching the scenic Peak to Peak Highway, racers will be treated to high alpine vistas, lung busting ascents, a taste of hard pack dirt road, and a total of 12,000 feet of climbing before returning to downtown Golden where riders can replenish their exhausted bodies but full souls. This course is sure to test your climbing prowess while treating you to some of the most ruggedly beautiful landscapes anywhere! The Golden Gran Fondo was also named one of the top Gran Fondo's by Outside Magazine. Grand Fondo National Championship Series® courses lead riders through country roads with challenging climbs and incredible scenery. Courses are offered in different lengths from 30 to 100 miles so participants can find the distance to match their goals. Each rider is given an electronic timing-chip to keep track of their progress throughout the course and to allow riders to compete for best time through highlighted sections of the course. Whether riding for a cause, a personal goal, or as a competition, the Gran Fondo National Champion Series® courses are some of the most beautiful courses in the US. "the toughest ride in the South." 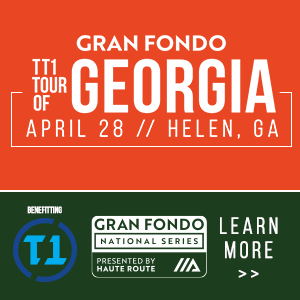 Upholding the tradition of excellence established 24 years ago, to create a challenging route over the highest point in Alabama "Mount Cheaha" and then back again, the Gran Fondo continues to fulfil the event's tagline promise to be "the toughest ride in the South." The original event has transitioned to a Gran Fondo with full age and gender categorized timed results and prizes including the King of the Mountain (KOM) and Queen of the Mountain (QOM). The event has routes of 24, 44, 62, 84, 100 miles for all abilities - but also boasts the ultra demanding and hilly distance of 124 miles. Hence its reputation. Luckily - well-known local rider Brian Toone who came 7th in the 2015 RAAM - will be on hand to answer any questions regarding preparing for the Ultra event. 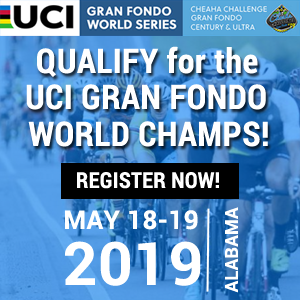 The Cheaha Challenge Gran Fondo has taken the lead as part of the Alabama Backroads Century Series promoting the growth and development of long-distance cycling in the state of Alabama - by encouraging participation in traditional and established Alabama century rides. Known for its tremendous community support, the Cheaha Challenge Gran Fondo commits a percentage of the proceeds from the event to each of the following: The Chief Ladiga Trail, Coldwater Mountain Trails, and the area's local Alabama High School Mountain Biking Teams. Creating a Legacy - Third edition of Indiana's first and fastest Century! Rollfast's vision is building a happier and healthier world through cycling. Matt and Chris Tanner founded the Rollfast Gran Fondo in 2013 with the objective of sharing their passion for riding bikes in arguably one of the prettiest landscapes in the Mid-West. The Rollfast Gran Fondo has three ride options to suit all skill levels and features a start/finish venue at the beautiful Carmel City Center, home of Trek "Legend" dealer, The Bike Line. The Rollfast Gran Fondo is Indiana's first and only Gran Fondo and one of the fastest century rides in the country, being completed in an astonishing 3h 52m in 2015. The Rollfast Gran Fondo is creating a cycling legacy in Carmel, Indiana. Over 16% of riders travel from out of state to participate in this well regarded and established event, which is likely to increase further this year. 3 of the most well-known professional cyclists in the world are known to regularly ride this event every September. Bob Roll is also confirmed for 2016. He'll be at the Platinum Party the night before the Gran Fondo. It's limited to 35 guests and sold out in hours last year. Last year's event sold out in record time. More places are available due to demand - but you'll need to register early to secure a spot. Southern California meets Italy at the Giro di San Diego Gran Fondo, a celebration of cycling, food, and San Diego's North Coast. Founded in 2012 and now in its 5th year, the Giro di San Diego is a perfect event for families. There’s literally something for everyone, with five different cycling events, including mountain bike courses of 10 and 30 miles and three road riding options: 38, 65, and 105 miles. The event caters primarily to casual riders, but offers VIP entry to professional racers in both disciplines. The 105-mile “Gran Fondo” route is the only local event to feature a timed climb up the South Grade of Mount Palomar. Often compared to France’s Alpe d’Huez, Palomar is a fabled climb, summiting at 5,240’, which has been featured twice in the Tour of California bicycle race. Lastly, over the entire weekend of the Giro di San Diego, a Bike and Fitness Expo with the ambience of a Southern California street fair is held in Solana Beach’s Fletcher Cove area, just steps from the Pacific Ocean. In 2015, in its inaugural year, over 1,200 riders celebrated with Jens Voigt along the best roads that Marin County has to offer. The 2016 Jensie Gran Fondo of Marin County is shaping up to be a spectacular ride. For those of you who go along with the family, they’ve arranged for Stafford Lakes Park to offer some fun activities which will keep youngsters engaged and occupied – who will wish their parents had not ridden the course quite so fast. This includes the new bike park that any non-Jensie riders can enjoy! In the words of Steve Olson, a cyclist who has taken part in many Gran Fondos internationally and rode the inaugural event last year - "Thank you to Jens Voigt and all the volunteers and sponsors at The Jensie Gran Fondo for making Saturday my best birthday ever and, indeed, one of the best days of my life so far! What an absolutely superb event! I'm already looking forward to coming back for next year's edition. :)"
Cycle and join the fight against Skin cancer! In its fourth year, the MSU Gran Fondo has drawn 5,000 riders from across the globe to its scenic Michigan course and has raised nearly $500,000 for Michigan State University College of Human Medicine’s skin cancer awareness, prevention and research. The “rolling party” on June 25 takes cyclists from downtown Grand Rapids to the Lake Michigan shoreline, experiencing West Michigan’s picturesque terrain and superfood stops along the ride. Cyclists of all ages and abilities can join as individuals or teams on the 12, 25, 40 or 80-mile routes. The ride includes electronic timing, ride results and SAG support. Fundraisers can earn a commemorative jersey, cycling gear and other prizes. All riders return to downtown Grand Rapids for a Finish Line Festival with live music, gourmet food, craft brews and wines. MSU Gran Fondo is an opportunity to join the fight against skin cancer and provide hope for more than 70,000 people in the U.S. expected to be diagnosed this year. Every dollar raised goes directly to research new therapies to treat skin cancer and improve the lives of those battling it. Registration opens February 1st 2016 and early entry is recommended! 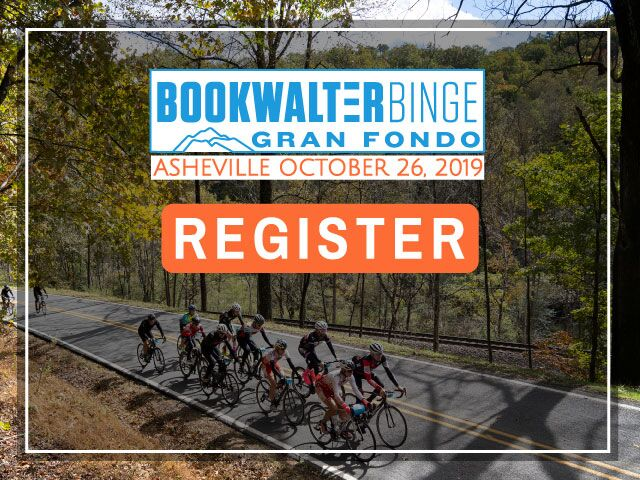 Join George Hincapie and cycling stars of the past, present and future on a challenging ride through upstate South Carolina in the 5th running of this popular event. View the leaves changing from one season to the next as George leads cyclists along the same roads he has ridden on training for races like the Tour de France and Paris-Roubaix. After completing the ride, join family and friends for a fun festival at the picturesque Hotel Domestique. Complete with live music, cold beer, and rides for the kids, this festival is a great way to cap off the day. Cyclists can choose from 3 routes of 15, 50 and 80 miles along the scenic Blue Ridge Foothills. Although these rides vary in length and intensity, each provide an exciting challenge for cyclists of every level. The Gran Fondo was also named one of the top 5 Gran Fondos in the USA by Men’s Journal. A portion of the proceeds from the event each year benefit the local charity Meals on Wheels in Greenville, SC. Last year, the whole Hincapie Sportswear team spent a day packing meals for Meals on Wheels, who deliver hot meals to nearly 1,500 homebound residents of Greenville County who have no means to prepare a nutritious meal for themselves and little or no support system to help them on a daily basis. The Meals on Wheels organization holds a special place in the Hincapie Sportswear family’s heart as they see the impact of this organization in and around the community on a daily basis. Through the Gran Fondo Hincapie ride last October 2015, they were able to raise another $20,000 for this great organization so that they can continue their work in our community. Entry is open and will sell out in advance, so early entry is advised! 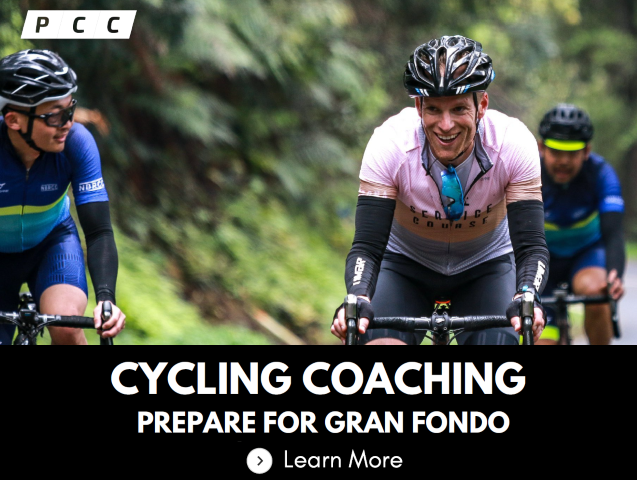 A Gran Fondo is supposed to make an everyday rider feel like a fully supported professional racer, and the Campagnolo Gran Fondo San Diego does so with true Italian panache. Founded in 2009, the event is now in its eighth consecutive year and the Italian bicycle component manufacturer Campagnolo has been its title sponsor since 2013. Riders line up under the iconic “Little Italy” sign in downtown San Diego, where professional announcers call up cycling celebrities and an impressive procession of Ferraris leads out the peloton. 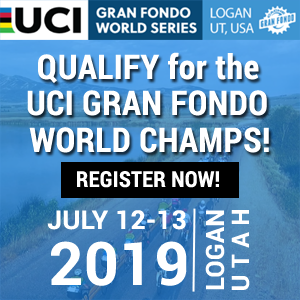 World-class Campy mechanics provide on-course assistance and the event culminates with finisher’s medals, free massage, and a four-course Italian feast. San Diego, dubbed ‘America’s Finest City’, is a world-renowned cycling destination, and home to mountains, beaches, deserts, and lakes. The Campagnolo Gran Fondo, one of the longest running Gran Fondo’s in America, showcases both its natural and urban wonders. San Diego shares Italy's temperate Mediterranean climate, and riders can look forward to cycling in ideal temperatures between 60 and 70 degrees Fahrenheit on event day. While the ride grows in popularity each year, it maintains a charming, friendly, and intimate personality. The routing options of the Campagnolo Gran Fondo San Diego offer something for everyone. A 20 mile Fun Fondo brings riders along San Diego’s picturesque Big Bay. The 32-mile Piccolo Fondo adds more challenge, heading inland for 900’ of climbing. Hardier riders will enjoy the 56mi Medio Fondo with 1,500’ of climbing, and the Gran Fondo route, at 105 miles, includes 5,000’ of climbing and a timed King/Queen of the Mountains competition. Challenged Athletes Foundation's® (CAF) Operation Rebound® program is the premier sports and fitness program for American military personnel, veterans and first responders with permanent physical disabilities. Registration is now open and early entry is advised! The 6th annual Campagnolo GFNY New York on May 15, 2016 will be the second GFNY Championship. Athletes will take on a challenging 100-mile route from NYC to Bear Mountain and back to compete against each other, the clock and themselves in a personal endurance challenge. The 50-mile GFNY BEAR on the same day is a non-competitive ride from NYC to Bear Mountain. Anyone can register for the GFNY Championship but GFNY Mont Ventoux, GFNY Deutschland, GFNY Italia, GFNY Indonesia, GFNY Cozumel-Mexico, GFNY Argentina, GFNY Mexico City, GFNY Uruguay and GFNY Colombia are qualifying events for the racer corral. In its eighth year, Levi’s GranFondo is both a challenging and competitive mass-start cycling event with riders of all ability levels from around the world. It began in 2009 with the inaugural event hosting 3,500 participants, and is the brainchild of professional cyclist Levi Leipheimer. Levi’s GranFondo is heralded as one of the best cycling events in the world by sources such as Red Kite Prayer, Road Bike Action and Outside Online. In an effort to make Levi’s GranFondo a ride in which almost any cyclist can participate, riders in the Gran Fondo have the choice of many routes, 11 in 2016. Regardless of what type of riding appeals to you or what fitness level you’re currently enjoying, they’ve got a route that works for you. Do be aware though, there are cut off times, so make sure you pick a route you can manage. Expect full support on course, with mobile mechanical support and full emergency services. They host eight rest stops, each with whole foods as well as on-bike liquid and gel energy. Expect mechanical service at each stop, as well as medics and vehicle support en route. Once the cycling is finished, riders and their families will come together at the park for a fun day filled with plenty of activities, live music and great food and beverages at the FondoSonoma Festival. They’ll have a whole suite of kid’s activities, including climbing towers, arts and crafts, science events, petting zoos, as well as parent support services to keep the whole family happy while waiting for you, the lucky participant to cross the finish line! Levi's GranFondo supports the King Ridge Foundation to raise money for at-risk youth. Over $1.5 million has been raised. Entry opened on Monday 11th Jan 10:00AM PST and will sell out well in advance - early entry is advised! Gran Fondo NJ 2014 was the first Cycling Event to Earn Gold Certification from the Council for Responsible Sport for its implementation of Sustainability practices. Gran Fondo NJ 2016 offers five challenging routes of 107, 75, 62, 42 and 18 miles, with timed hill climbs on the Gran, Migrane, Medio and Piccolo routes. The 62-mile Medio Fondo route was selected by the editors of Bicycling Magazine as one of "The 50 Best Rides in America." All routes begin and end in historic Morristown, New Jersey. For the 4th year in a row, in its post-rider survey over 97% of of riders said they would recommend the event to a friend. Gran Fondo NJ started in 2011 as the brainchild of Marty Epstein, owner of Marty's Reliable Cycle. The goals of the event were quite simple: Create a very challenging cycling event targeted at all levels of cyclists; Introduce the Gran Fondo experience to New Jersey and surrounding areas, and; Give back to the community while doing so. The event features some of the nicest cycling in the Unites States and provides a well crafted balance of competition and fun. Only the toughest climbs on the routes are timed so participants can relax and enjoy the majority of the day, yet still challenge themselves to achieve a new "Personal Best." In its first 5 years, the event and its participants (fundraising is optional) have raised over $750,000 for local and national charities. Gran Fondo NJ has seen consistent year-over-year growth (just over 1,000 participants in 2011 growing 2,200 in 2015) and is rated extremely highly by those who experience it. For the past 4 years in its post-ride survey, roughly 40% of participants have consistently rated it "The best one-day cycling event ever." and over 90% rated it 8 of 10 or higher. 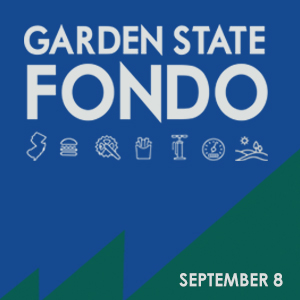 Whether it is the Mass Start with over 2,000 cyclists, the Seeing Eye dogs and puppies who greet you at the first rest stop, police controlled intersections along a well marked route, the surprise foods at the six Rest Stops, or the seemingly endless climbs, finishing Gran Fondo NJ is sure to provide its riders with some amazing cycling memories. Registration is now open and the event will sell out in advance - early entry is advised. We hope you enjoyed our list of top Gran Fondos in the US for 2016. For details of dozens more Gran Fondos and hundreds of Centuries, Charity and Leisure across the USA, please visit our 2016 US Gran Fondo calendar.